But the similarities – the superficial ones at least – are overwhelming. It’s in the eyes. The voice. It’s in that split-second pause he takes, during which I just know that the next thing he says will be funny. Neither are there any trappings of fame in evidence, to remind me that I’m talking to a accomplished actor, comedian and author here. When we sit down for the interview, there are no PR people hovering. In fact, O’Hanlon even calls me personally in advance to confirm the arrangement. In the decade since Father Ted , the Monaghan comic has gone on to enjoy continued success, starring in two BBC sitcoms, My Hero and Blessed . (The former ran for five series with O’Hanlon in the starring role – two more than Ted’s three.) He has also made TV documentaries and toured extensively as a stand-up. His 1998 novel The Talk of the Town, meanwhile, was recently selected among Peter Boxall’s 1,001 Books You Must Read Before You Die . So if he resents the way such a respectable body of work constantly gets overlooked in interviews, he is probably entitled to. But such is the grip that Ted continues to exert over the public in this country, this writer included, that we stubbornly refuse to move on. No wonder then that the release of his new film, Wide Open Spaces, is so eagerly anticipated. Shot in Kildare and directed by Tom Hall (Bachelors Walk), the film reunites O’Hanlon for the first time with Father Ted co-creator Arthur Mathews, who wrote the script. Elements of the plot too, which centres on a woefully misconceived scheme to open a Famine Theme Park in the rain-sodden Midlands, could also have been lifted directly from a lost episode of the show. The film score was even handled by another Ted veteran, Neil Hannon of The Divine Comedy . In that regard, Mathews has certainly succeeded. Wide Open Spaces is a dark, slapdash comedy that is likely to bewilder as many as it amuses. It doesn’t possess – nor does it aim for – anything like the broad appeal of Father Ted. Early reports cited the breaking up of a friendship as one of the film’s main themes, igniting speculation that the story might have been inspired by the break-up of Mathews’ writing partnership with Graham Linehan, with whom he created Father Ted. If nothing else, the finished product surely puts paid to that theory. O’Hanlon and Ewen Bremner (Trainspotting) star as a pair of ageing slackers who chance their way into the debt-collecting business after meeting an eccentric entrepreneur (Owen Roe) in a Dublin pub. Any attempt to summarise the plot beyond that would probably be pointless. As well as promoting Wide Open Spaces, O’Hanlon, who returned to live in Ireland with his family a number of years ago, has just completed filming the Mathews-penned sitcom Val Falvey TD for RTÉ. He’s also in the process of writing his first play, but intends to return to stand-up in the autumn. What possessed him to consider a career in comedy in the first place? By the time he moved to London in the early 1990s, the comedy clubs there held no fear for him. We talk too of his television work. After Dougal, his next major role was as the equally gormless, equally likeable, George Sunday on My Hero. Even his unlikely turn on the edgy teenage drama Skins doesn’t buck the established pattern too much. 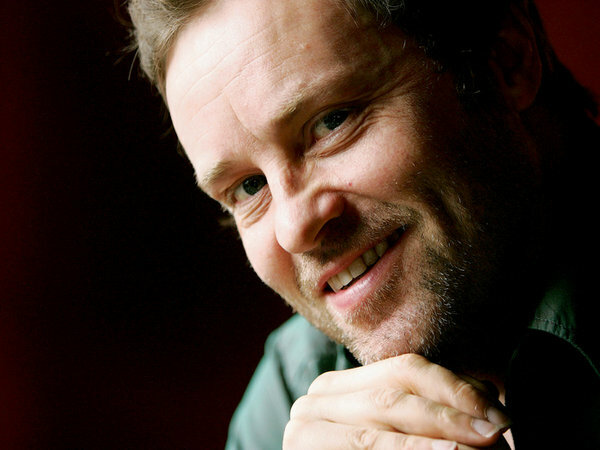 O’Hanlon plays Kieran, a teacher who earns the trust of a troubled pupil only to blow it, by making a clumsy pass at her when she comes to look for his help. There’s a clip on YouTube in which he can be seen attempting to explain to an American interviewer how popular Father Ted was in Ireland when it was first aired. If anything, I tell him that he seems to underestimate the show’s impact – as a teenager in Mayo, I would sneak into our local pub on a Friday night to watch it. People of all ages, all occupations and backgrounds would gather to watch it. They’d shut up, listen and laugh together at the show, in a way I’ve never seen happen before or since.